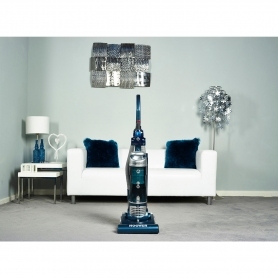 Available in a silver and blue colour scheme, this upright vacuum cleaner from Hoover, offers great dust pickup across a range of floor types. Holding an A-rating for energy efficiency, the TH71_VX02 meets the latest in European eco-design. A bagless unit, this model’s dust bin can hold up to three litres, meaning you’ll be able to clean for longer without having to empty it. 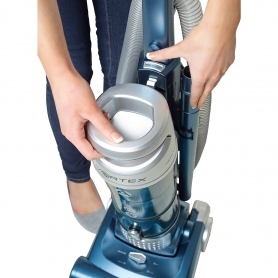 Clean your house from top to bottom with a range of attachments and features. 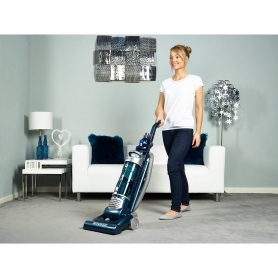 The TH71_VX02 comes with a 2.5 metre stretch hose, making it easier to clean up high or in tricky spots. 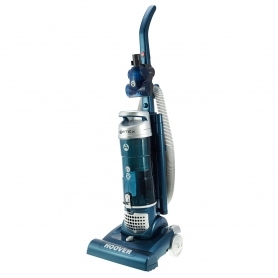 Combined with the long crevice tool, this model makes vacuuming in corners or behind furniture easier than ever. 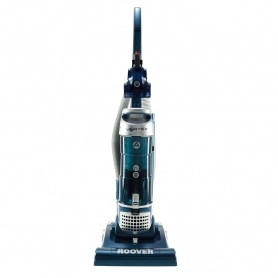 Enjoy a more complete clean with this Hoover appliance. 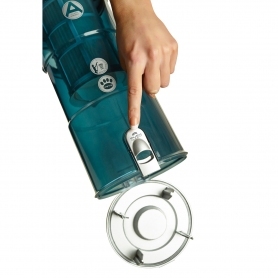 Also included is the Turbo Brush, a perfect attachment for tackling tricky pet hair. 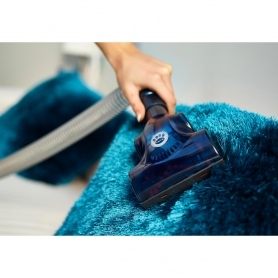 Having a vacuum cleaner that can deal with hair is essential for any pet owner’s home, especially as pet hair can carry odours and allergens. 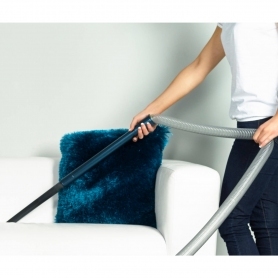 This attachment contains a powerful rotating brush, which loosens and lifts stubborn hairs, leaving stairs, carpets and upholstery free from dirt and debris. 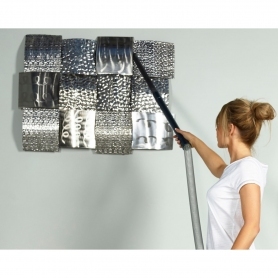 Powerful edge cleaning on this model removes dirt all the way up to your skirting board. 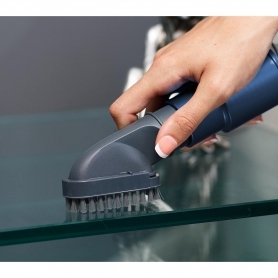 The rotating brush bar has been designed to clean right up against walls and furniture, picking up what some other models leave behind. 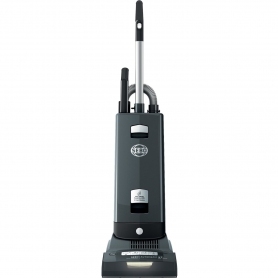 For spotless results across all of your floors, try the TH71_VX02. 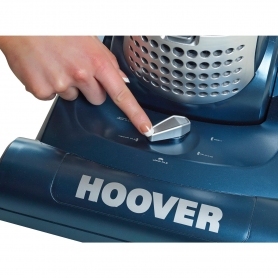 Washable filters also feature on this Hoover vacuum, so you can keep it working at maximum efficiency. Maintain lasting performance and strong suction. 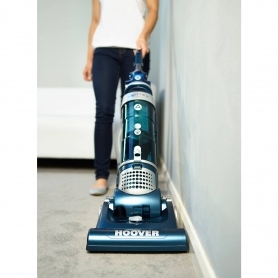 A five-metre power cord on this vacuum cleaner gives you room to manoeuvre, so you can clean from room to room and stay plugged in. 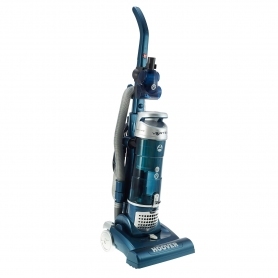 With a number of useful attachments, Hoover’s TH71_VX02 offers powerful cleaning across a wide range of floor types. Order yours now.